For the past six plus years now Apprising Ministries has been among many who’ve been pioneering a new mission field of online apologetics and discernment ministry. An area of serving the Church that is every bit as viable as when the late Dr. Walter Martin realized there was a kingdom of the cults no one was ministering to. In similar fashion, the visible Protestant community has become more and more fragmented; and at the same time we’ve seen the rise of cult of personalities within the professing Christian community where only “names” within a given sector have the ears of the masses. A bad combination as spiritual darkness continues falling. So the Lord has begun raising up works like this one in order to cover issues that are springing up and/or being uncovered as Jesus rains 1 Peter 4:17 judgments upon the visible Christian church. The fact is, if the names were addressing these things in this time of division within Christendom then you’d have never even heard of me. Remember, even Satan can read and our Lord did warn us — “Every kingdom divided against itself is laid waste, and no city or house divided against itself will stand” (Matthew 12:25). Well, as you’re about to see, sadly even within this community of online apologetics and discernment ministries we see a possible coming divide. What would appear to be at the root of this particular difference is a book called The Harbinger (TH) by Rabbi Jonathan Cahn. For more background I point you to The Harbinger: Prophetic Fact Or Fickle Fiction? There I referred you to three different well-written reviews of TH by Gary Gilley, Larry DeBruyn, and David James. The Harbinger, by Jonathan Cahn,1 is about a series of signs or omens which he believes have manifested in America beginning with the terrorist attacks of September 11, 2001. The author believes he has discovered an ancient mystery in Isaiah 9:10-11 that “explains everything from 9/11 to the collapse of the global economy.”2 Although he uses a fictional narrative as a framework, the book is based on what he believes are undeniable facts from the biblical text, the corresponding history of 8th century B.C. Israel and current events of the last decade in America. Cahn remains silent; neither agreeing with, or correcting, the comment. To me, this somewhat obscures his real motivation for TH, which then serves to keep this work mostly hidden in the shadows. By not responding to the interviewers one way or the other Jonathan Cahn can then claim he personally never he was a prophet, etc. The heart of a biblical hermeneutic is the commitment to understanding the literary context of a passage. This is where Cahn’s thesis first runs into trouble. Nothing in the context gives any indication that either Isaiah or the Lord intended for Isaiah 9:10 to be understood as having to do with anything other than the Northern Kingdom in the 8th century B.C. Although the author has insisted in a moderated discussion with this reviewer that he does not believe Isaiah 9:10 is to, for or about America,4 the book paints a very different picture. Although Cahn has tried to explain that the passage is only functioning as a “sign” to America, this is not a meaningful distinction. Biblical signs are revelatory and therefore prophetic, in that they signify that something is happening or is going to happen. And, this is exactly the way Cahn handles these “harbingers” in the book—meaning that in at least some way he actually does see a direct connection with Isaiah 9:10. The Mystery of Isaiah 9:10: A Direct Link between Israel and America? The author denies that he is arguing for a direct connection between Israel and America and maintains that the passage only demonstrates a pattern of God’s judgment. Likewise, he concludes that recent events in America, beginning with 9/11, are only parallels to that specific pattern. The Mystery of Isaiah 9:10: A Driving Force? This comes perilously close to being a mystical view of the prophetic Scriptures because biblical prophecies do not function this way. Any prophecy as specific as Isaiah 9:10 also has a unique, specific future referent in view which sets parameters and limits on what constitutes literal fulfillment. That what is being suggested about Isaiah 9:10 sounds more like a sort of mystical incantation than a prophecy is reinforced when the author introduces the idea of “The Isaiah 9:10 Effect” later in chapter 15. Cahn claims that the previously unknown “Isaiah 9:10 Effect” was launched in America on 9/11. It is now on a trajectory that cannot be stopped. God has provided nine harbingers, or signs, to America, just as He did to Israel, as a means of warning her of impending judgment. Yet, if Isaiah 9:10 was written as more than just a prophetic word to Israel, but also as a warning of a pattern for future nations, where is the pattern? 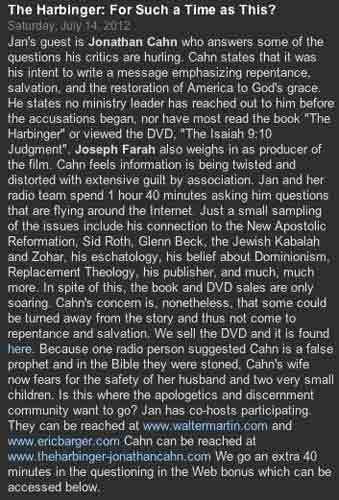 We’re told, “The radio team also asks why not one critic would reach out and contact Cahn before the criticisms and accusations began?” Leaving aside the loaded term “accusations,” the fact is, when Jonathan Cahn decided—for whatever reason—to take his teachings and then publish them in a book, he entered the public arena. We’re told, “Cahn states that it was his intent to write a message emphasizing repentance, salvation, and the restoration of America to God’s grace.” I’ve not seen anyone credible in the discernment camp deny this. I also don’t know anyone who thinks this is anything other than admirable and necessary; good for Jonathan Cahn. Above I addressed the nature of the public arena. However, if Jonathan Cahn really has “stated” what we just read, isn’t he now hurling accusations himself? How does he know “most” of us in the field of online apologetics and discernment ministry haven’t read his book and/or watched the DVD in question. Answer: He doesn’t. Next we read, “Cahn feels information is being twisted and distorted with extensive guilt by association.” I say, fair enough; fine. Jonathan Cahn is welcome to his opinion. However in the same way, for example, I am just as entitled to share in my criticism of TH that I personally believe Cahn has “twisted and distorted” the Scriptures. In addition I could also argue that the Markell radio itself, with its talk of discernment ministries in general, has now also implicated me by using guilt-by-association. We’re also told, “Cahn’s concern is, nonetheless, that some could be turned away from the story and thus not come to repentance and salvation.” A valid concern. Well, I have one as well: I’m concerned that because of these sweeping statements made by “Jan and her team” toward an unspecified “discernment community” some could be turned away from those of us who strive to cover online apologetics and discernment issues with the highest of Christian ethics and be swept up into falsehood. Might we look at this as the Markell team acting as shrill accusers of the brethren? I happen to know Brannon Howse, we spoke on the phone just today. He is the host upon whose program the other “radio person” mentioned above, Jimmy DeYoung, made the alleged suggestion. Howse released a partial transcript right here. Interesting comments when you consider what you’ve seen here in this piece, no. Might I use this opportunity to offer that we begin to call out publicly, by name, who we’re talking about; if not, we’re guilty of sowing confusion ourselves. Making these kinds of statements toward nameless ministries only serves to cause to division. Now I will leave you with the following to make sure it’s on record what I am criticizing concerning the public work of Jonathan Cahn. As you’ll see, as a pastor my main concern is establishing that Cahn is misusing Scripture in making the case for his harbingers of God’s judgment upon America, particularly Isaiah 9:10. “Yes,” he replied. “There was always another side to the covenant. If ancient Israel fell away from God and turned against His ways, its blessings would be removed and replaced with curses.” “But wasn’t Israel surrounded by nations far worse,” I asked, “with no concept of God or moral code? So why would Israel be judged?” “Because to whom much is given, much is required. And no nation had ever been given so much. None had been so spiritually blessed. So the standards were higher, the stakes greater, and the judgment, when it came, more severe.” “And America…” I said. before its destruction by Syria ancient Israel received prophetic omens of warning. Well, my guest today [Jonathan Cahn] has observed that those same nine signs are being revealed right here in America. I’ve gone into this depth to show that someone like me is hardly being shrill to call Jonathan Cahn out on his misapplication of that passage of Scripture. In fact, it’s literally part of my job as a pastor to do so (cf. 2 Timothy 4:2). As I see it, Jonathan Cahn clearly implies America is on the same pattern for judgment as ancient Israel. For Cahn to do so is to draw a parallel with God’s covenant nation Israel. So, while he claims he is not saying this, the logical conclusion is: If Israel as a covenant nation with God was warned thusly, then for God to warn America in the very same way, Cahn has implied the United States is also in some kind of covenant with God. And finally, June 26th I wrote The Harbinger: Prophetic Fact Or Fickle Fiction? I would then later receive an email from Jonathan Cahn entitled The Article by Erin Benziger on The Harbinger. He was actually referring to the Erin Benziger article I cited earlier. He asked me to keep that initial email confidential, which I have. He stated that Benziger’s piece in particular had “some major factual errors.” In my opinion it does not; however, as General Editor of the CRN website I did write back to Jonathan Cahn. I hadn’t planned upon sharing it, or Cahn’s response, until the Jan Markell radio team decided to make the claims which I walked you through above. Thank you for contacting Christian Research Network, which extends from Apprising Ministries. Please know there was no offense taken and I received this as written from a point of sincere concern. I’m responding in the tone of two people talking about issues over coffee. Jonathan, when you wrote that book you became a teacher in the public arena. There is no “biblical propriety” where I need to afford you a forum here at CRN to respond to any public critiques we do of your work. As far as James, you’ve already addressed him elsewhere, which is your prerogative, of course. You also said of Benziger’s piece “there are some major factual errors.” I happen to know that she’s gone through hours of interviews you’ve given as well as interacted with your book itself. In addition, from my own personal research, and having also written on this subject, I would have to disagree with you concerning this matter. Again, you are welcome to write your own rebuttal and show me where these alleged errors are. That’s entirely up to you. A couple of major concerns I have is AUTHOR OF THE HARBINGER JONATHAN CAHN TELLS US: “90 PER CENT OF IT IS NON-FICTION” and your misuse of Isaiah 9:10 as if it’s a standard for all nations. If you have a prophetic message from God, why don’t you come out and stand by it? Since it concerns the judgment of the nation don’t you think you have an obligation to be forthright with the warning? What Biblical prophet played cat and mouse when pronouncing God’s judgment, certainly Isaiah didn’t hold back. Which brings me to the historical passage in Isaiah from which you life verse 10 out of its context; that being the warning of the coming destruction of Israel. In his classic commentary The Book of Isaiah the great scholar Edward J. Young lists these verses 8-17 of Isaiah 9 as “The approaching destruction”. It was specific to Israel. Also, if Isaiah 9:10-11 functions to demonstrate a pattern of God’s judgment, as Cahn believes, why is it not identified as such, either here or elsewhere in Scripture? If it is a predictable pattern as he suggests, why is there neither a precedent nor repetition of the pattern in the Bible? Jonathan, the truth is, you’re reading into Scripture what just isn’t there and I pray you’ll repent of this sowing of confusion. Notice: The information contained in this e-mail message, including any attachments, is for the sole use of the intended recipient(s) and is to be considered privileged and confidential under the pastor-client privilege. Any unauthorized review, use, disclosure or distribution is prohibited. If you are not the intended recipient, please contact the sender by reply e-mail and delete the original message and all copies from your computer. I appreciate your reply and your taking the time to share with me your thoughts about everything. Just to share and clarify, I actually felt that the tone of your article and Erin’s was much more thoughtful (and less hysterical and extreme or careless ) than most of what I’ve seen. I appreciated also that both articles sought to be careful to also highlight what was felt to be good about the call of The Harbinger – and it was more along the lines of here are some cautions to consider. I respect that very much. Note – When I speak about errors, I’m not in any way implying that anything was intentional or the result of careless, but rather from misunderstanding a few key things. I didn’t realize that one of our congregants wrote you to ask about a “rebuttal” I wouldn’t characterize anything I would write as a rebuttal – but rather to explain, answer, and clear up a number of points and misunderstandings in the same good and respectful tone in which you and Erin wrote. It probably wouldn’t be very long. As to the propriety of affording someone the opportunity to address issues, I can’t speak for every case – but in this case I would say definitely yes on several biblical counts. One is that our obligation is to the truth and if something has been said that (even unintentionally) misrepresents or is not the truth, we have an obligation to rectify it. Second, in the body, if we (even unintentionally) misrepresent another minister, ministry, or work of ministry within the body, it is not only something false, but something against a minister or ministry in the Lord – and is also indirectly against the reader. Third, if we do this publicly, the misrepresentation and wrong done is multiplied. And if a brother or sister had (even unintentionally) misrepresented your ministry or work in the Lord, And did so publicly to many people – you would want a chance to address and explain from your end. One ends up (again, even if unintentionally) bearing false witness. In such a case, yes it would need to be rectified and the opportunity given for these to be addressed. So I am hoping for the same integrity that I saw in both yours and Erin’s attempt to give some balance in your articles, to be applied now. I would not presume that whatever is written to you would have to be posted – but that you would be the judge of whether what is written – whether it is appropriate, fair, clarifying or enlightening, deserving of being posted. I would be fine and entrust your judgment in that. But on my part, before I write, I would have to know that you would give fair consideration to what is sent you and if it meets this criteria, that it would be posted. So with the understanding written above, may I address the concerns/ and that which was factually wrong, confused, or misunderstood and sent it to you for the possibility of posting according to your consideration?